robisher's gold mines were soon forgotten, and even their locations were lost to history. 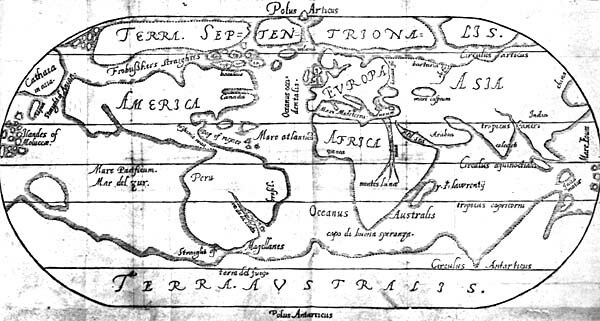 Nevertheless, the Frobisher venture sparked English interest in both a Northwest Passage to Asia and English sovereignty over northern North America. This map shows "Frobushers Straightes" leading to "Cathaia" (China) across northern North America. 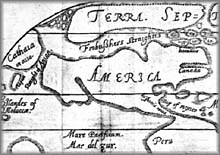 These straits provided a short and easy route to the Orient according to George Best, one of Frobisher's captains who published the map in 1578. Frobisher's newly discovered lands were included in maps drawn by James Beare (left), principal surveyor of the expedition, and by Michael Lok (below). 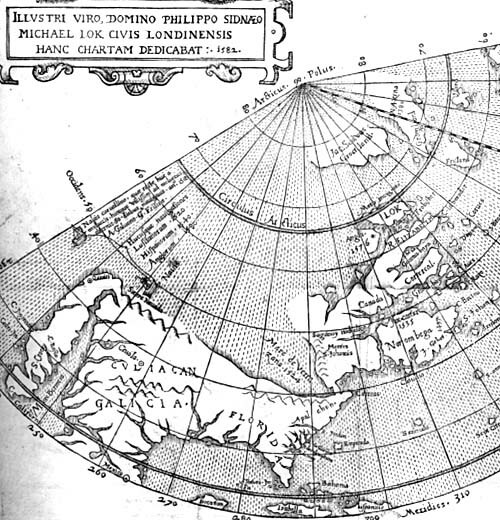 John Dee is credited with having first conceived the idea of a British Empire, and Frobisher's land-taking in Arctic Canada was the impetus for this idea. 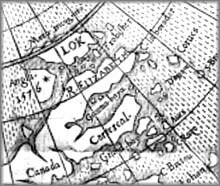 In the centuries that followed, British exploration and commerce gradually penetrated Arctic Canada, and British claims to possession of the area were assumed by most European nations. British sovereignty in the Arctic was passed to the new nation of Canada in 1880. 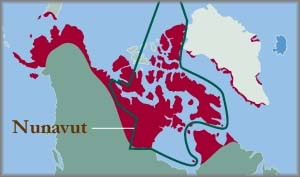 In 1993 the Tungavik Federation of Nunavut negotiated a land claim agreement with Queen Elizabeth II in Right of Canada. The agreement returns a measure of sovereignty to the descendants of the original Inuit occupants of much of Arctic Canada, and took effect April 1, 1999. At the same time, the Northwest Territories was divided and the new Territory of Nunavut established. 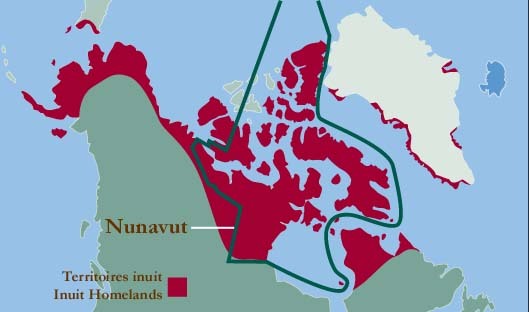 The capital of Nunavut is Iqaluit, a town at the head of Frobisher Bay in the very area where over 400 years ago Martin Frobisher sought the Northwest Passage and claimed the land for Elizabeth I.
Map of the northern world showing lands occupied by the Inuit and the new territory of Nunavut. The political changes which began as a result of the Frobisher voyages have finally come full circle.